Today, marketing is a war where the internet is the battlefield. And, the marketers are online warriors who are trying every possible way to win this war. But a warrior is incomplete without its sword and in this scenario, the sword is Digital Marketing. Yes, you have read right! Marketers have been learning various digital marketing strategies to win over this competition. They have taken pieces of training from various online marketing training companies and worked under experienced marketers to enhance their marketing skills. However, the time comes when marketers feel messed up and seek a guidance to understand what are the various ways to enhance their marketing skills. Many times, they approach influencers and ask what are the best digital marketing skill sets that marketers must have in their resume to get highly paid packages. With this competition, there are instructed in-demand marketing skills that employers look for in their marketers while hiring them. We totally understand that a perfect digital marketer is far like an achievable dream but with the right marketing skill sets, one can easily at least be near the par. Being a digital marketer means understanding each minute tactics of the new web algorithms and know how to work by keeping them in mind. An ideal marketer is the one who always stays updated with current online discoveries, know how each of the social and digital channels operates & interacts with each other and the synergies they create. Why do you need to work on your digital marketing skill sets? How can you improve your marketing skill? How different should your Facebook post be to Twitter or Instagram, tactics? What are the essentials that you need to keep in mind while making email marketing strategies for higher conversions? How can you build better content marketing strategies with respect to search engine optimization? If you come up with these thoughts more repeatedly, than you need to work on your online marketing skills. As your audience is constantly being bombarded with ads, messages, distractions and a whole lot more; it’s a high time that you need to enhance the skills that will allow you to create marketing strategies and let your content stand out in a crowd. Hard Skills and Soft Skills. 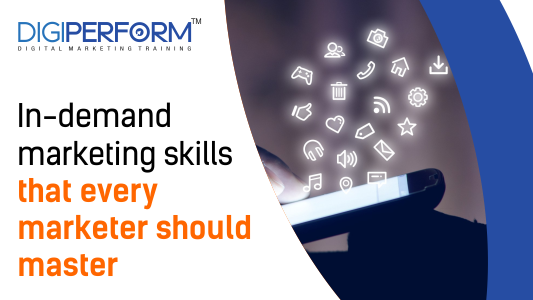 Let’s read out what kind of in-demand Marketing Skills that every marketer should master. Social media is the only platform in the world where the population spends numerous hours watching, posting, reading and exploring different events. This is the ideal platform for marketers to increase business’ recognition, traffic, and sales with little to no cost. 90% of experts have claimed that social media generated immense exposure for their company, and that’s only one of its many advantages. Content is the soul of any marketing strategy. It is the most effective, practical and useful digital marketing strategies that your brand can use to reach and engage more quality leads and customers. The purpose of content marketing is to attract, engage and delight customers in various ways which can be in many forms; like blogs, videos, pictures, audio, ebooks, etc. Increases the visibility of your brand. Develops lasting relationships with your audience. Improves brand awareness and recognition. It is an effective medium to reach out to your target audience. Its proven that 90 percent of online searches are conducted by people who are at the end of the buying cycle. It involves implementing an online marketing strategy so that your content (product or services) get visible to a targeted audience in terms of SEO, PPC and other forms of internet marketing such as banner ad campaigns. It also involves managing your online reputation and a host of other online marketing initiatives. Automation is a term used for the platform, or tool that allows companies to streamline, automate, and measure marketing tasks and workflows. The ideal agenda of automation is to increase operational efficiency and grow revenue faster. Such as, it includes email marketing automation to demand generation to revenue attribution. No wonder, no campaign is ever perfect. Instead of spending hours on creating and send emails responses to each individual, automate your online marketing tasks will give you a more time to focus on marketing strategies rather than administration. Web analytics helps businesses make smarter and informed decisions about their web presence. The strategies we follow in digital marketing such as paid advertising, AdWords, social media, etc can be easily studied through analytics. This data is generally used to improve the user experience, increase the rate at which customers purchase, or drive some other online or offline action. Treat data as a strategic asset. The shift towards mobile is huge in this millennium that will continue further as well. Mobile marketing allows the marketer to reach larger audiences in a personal way. It unlocks powerful opportunities for marketers and plays a key role in marketing strategies. Therefore, marketers need to ensure that they have a cohesive mobile marketing plan to connect with those digital consumers. It is the quickest ways to reach out to customers and prospective buyers. ROI in mobile marketing is easy to calculate compared to other forms of marketing. Instantaneous results – User response can be tracked almost instantaneously. Mobile Marketing has better chances of gaining higher search engine ranks. Visual marketing is the process of marketing with photos, videos, and other visual elements that attest to the value of your product or brand. It focuses on using unique and relevant images clustered with various elements to pull consumers in. Visual marketing campaigns are more likely to be shared and get clicks than text ads would. Reach more people with engaging visual content which increases social media shares. Creativity is recognizing connections in digital marketing that gets appreciated very well by audiences. A great marketer spends a good deal of time thinking about and refining marketing strategies. Therefore, as a marketer, you should spend more time creating schedules and chasing deadlines for designing images and brainstorming new ideas. Creativity plays a very important role in creating marketing strategies. As a marketer, you should always be looking for new ways and try to experiment in your own ways. Research lies at the heart of an effective marketing strategy and it should represent the current competition. So there’s great value in knowing how to spy on competitors with digital marketing tools like SEMrush. These tools help to identify that what keywords are they targeting and what are they ranking for? Another aspect of competitive research involves advertisements that give you a comprehensive look at what online ads a competitor is running, all in one convenient place. Internal and external communication in the digital marketing realm seems to be a necessary deal for Businesses. In most instances, poor communication is attributed to workflow ramifications. The interesting part about internal and external communication is the fact that most companies tend to overlook these challenges. Therefore, don’t hesitate to pour your heart out and share your creative idea with the team. Communication is the first step to succeed in your journey. It’s a myth that once you have taken digital marketing training, you will be considered as an expert. Training guidance is important but you need to work on yourself as well. If you want to be part of this industry and maintain your aura as a well-experienced marketer, you need to enhance your skills. First, try to find out from this post which type of marketing skill you lack and start working on it. On the other hand, we are here to guide as well. So, let us know if you have doubts and want us to cover up for you. It would be a pleasure for us to help you. How can digital marketing benefit Software Engineers? 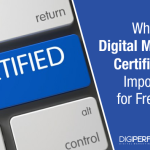 Why is Digital Marketing Certification important for freshers? How to Brand Yourself as an Expert to Get More Job Offers?